You might look at one of these Glass Potion Bottles and scoff at the notion, but trust us when we say that you'll regret not having one. Whether you're in the realms of high fantasy or historical accuracy, anyone can make effective use of one of our impressive Glass Potion Bottles. Intrepid adventurers of all sorts will find that these glass bottles are virtually indispensable, whether kept filled or empty. Many of the glass bottles you'll find here are available in different hues, allowing you to retain a color scheme to your outfit or ensemble. And many of them also feature attractive, hand-crafted holders that attach right to your belt, allowing for easy retrieval. Each glass potion bottle is good for dozens of uses, ranging from holding magic potions that restore your health and vigor to capturing mystic little fairies. You can even store fairy dust or vampire ash in them, as well as anything else that's powdered, crystalized, or liquefied that you might want to carry around with you! The usefulness of our Glass Potion Bottles are nearly unmatched, if only because each and every bottle you find in this category will allow you to carry around whatever fluids, powders, or tiny creatures that you might need in a medieval setting. 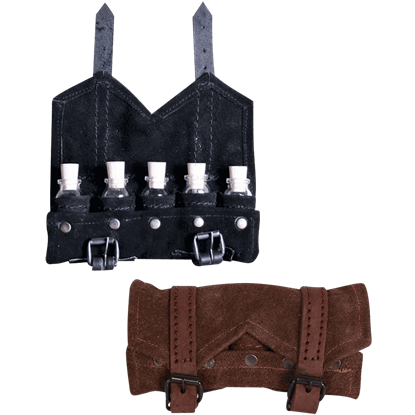 Keep your potions and your sword at hand when you wear this Alchemist Baldric with Glass Vials. 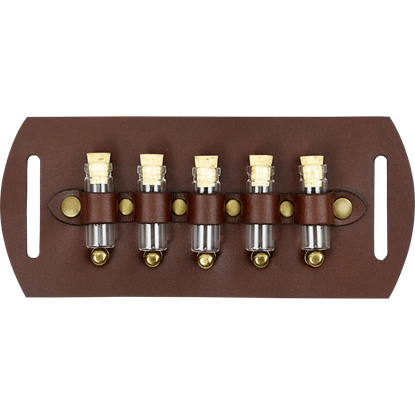 Displaying six corked glass vials along the chest, this leather baldric also has an adjustable sword frog with two buckles at the hip. Called to attend the lady of the manor, the alchemist removes a curious pouch from his belt. 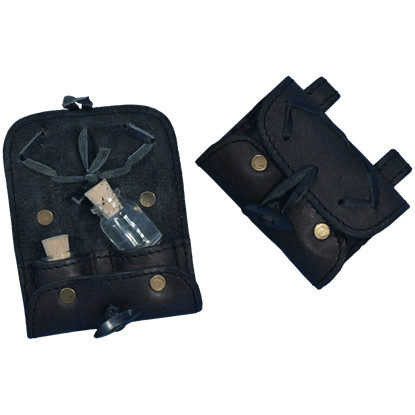 Releasing the clasp of the Alchemist Pouch with Glass Vials, he opens the leather satchel, selecting from among the tonics secured within. 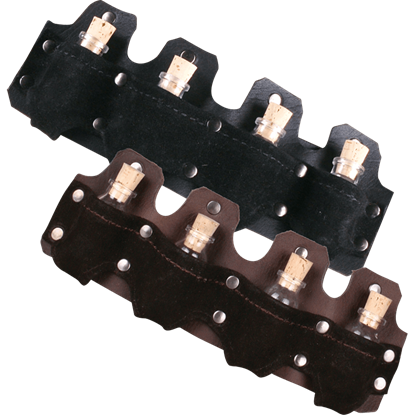 Whether you are battling the bean sidhe, the pooka, or the dreaded Saxon army, this Celtic Three Bottle Holder Belt Slide will hold your potions in style. Create your own utility belt with this Celtic-inspired leather belt slide. The alchemist, potions master, or mage requires easy access to their elixirs. 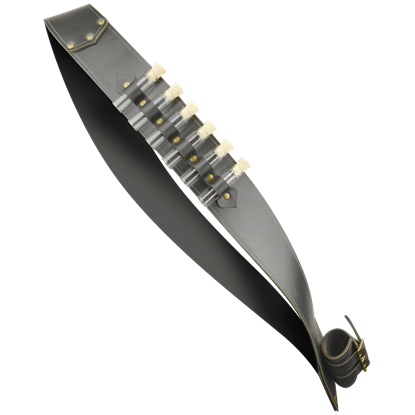 For quick use in battle or collecting rare ingredients, the Doran Potions Belt Slide is a great choice. It is ideal for a LARP event, or fantasy convention. 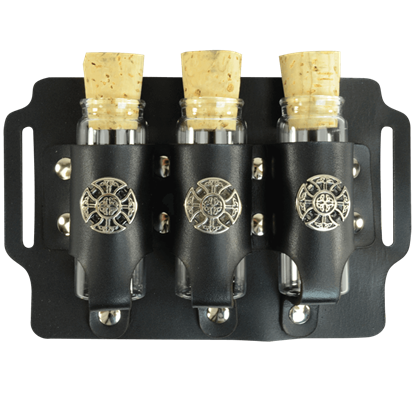 The Five Bottle Steampunk Belt Slide is ideal for giving fantasy outfits a fresh look. Keep your potions close at hand with this easy-to-wear leather accessory. Available in black and brown, the hardware is antique brass in tone. 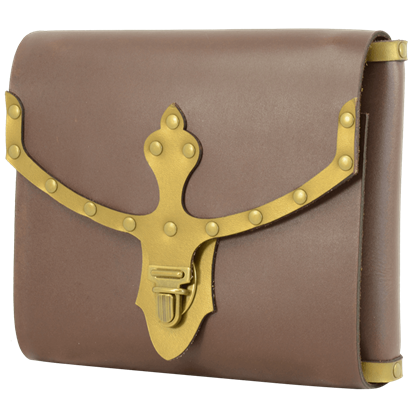 Keep all your vital potions safe, secure, and ready to go with the Friedhelm Potions Bag. 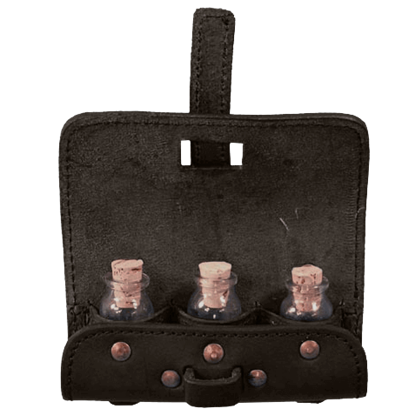 Made of soft suede, this bag comes with five small glass bottles snugly held within its compartments and sealed shut with natural cork. 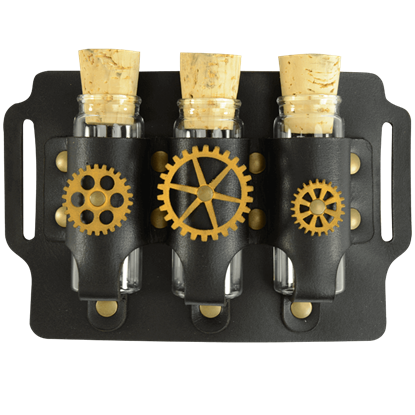 Perfect for Neo-Victorian alchemists, steamship engineers, and inventors, this Geared Steampunk Three Bottle Holder Belt Slide makes a fantastic addition to a utility belt. The gear accent adds a touch of whimsy to your ensemble. 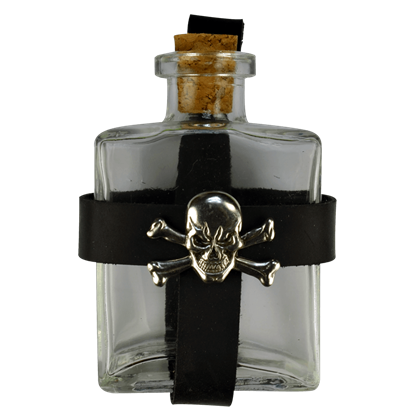 It will be hard to find an accessory as versatile as this Glass Pirate Bottle with Jolly Roger Holder. The benefit is quite obvious, as it can be used to carry virtually anything, from dry goods to drinkable liquids and more. 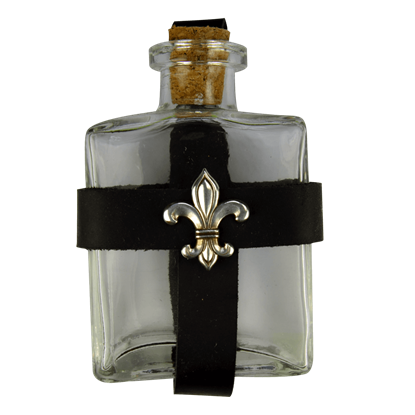 It will be hard to find an accessory as versatile as this Glass Potion Bottle with Fleur De Lis Holder. The benefit is quite obvious, as it can be used to carry virtually anything, from dry goods to drinkable liquids and more. 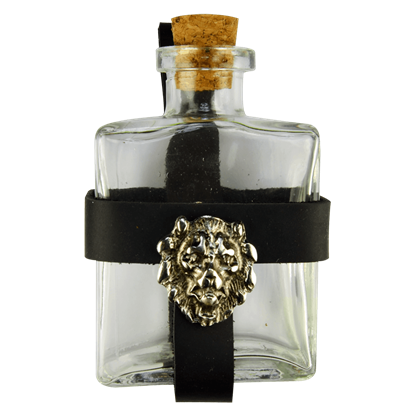 It will be hard to find an accessory as versatile as this Glass Potion Bottle with Heraldic Holder. The benefit is quite obvious, as it can be used to carry virtually anything, from dry goods to drinkable liquids and more.